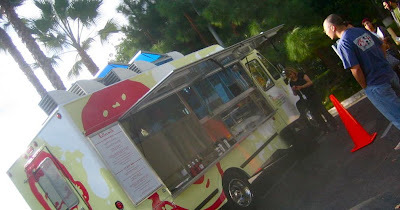 I finally managed to catch a new LA food truck this morning. The @ButtermilkTruck, which serves breakfast-style goodies, came down to El Segundo, so I made my way over there before they left for a little late breakfast. While it seems like an unlikely niche to go after, it seems like a good one to me. When breakfast food isn't good, its still usually not bad; and when its good, it can be reallly good. I'd put this in that category. I tried the french toast sticks - again, when is french toast ever bad? But make it out of Hawaiian bread with a well-spiced batter and wow. 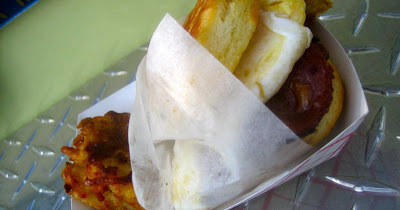 The breakfast sandwich was also really good too - a lot of flavor in the biscuit and whatever bacon they used. Maybe it was the time of day or maybe it was the breakfast food, but people at this one seemed a little more friendly and social, but that could also be because the guys in the truck were the same way. I was amused to hear someone in line say "I joined Twitter just to follow the food trucks" because it was what started me as well. Count this as yet another great find thanks to Twitter. It's definitely one of the best of the trucks I've sampled so far.